This week, on Tuesday, President Obama gave his first State of the Union Address of his second term. In the speech, the President offered some pretty lofty objectives for his last four years. They included universal preschool, immigration reform, and gun control legislation. And, though it was an epic piece of oratory, one of the most memorable points of the night came, not from the President, but from Marco Rubio who gave the official Republican response to the SOTUA. Why was it so memorable? Well, because about 11 minutes in, Rubio was so parched that he took a huge gulp of water from a bottle that was like 10 feet off-screen. It was amazing television. 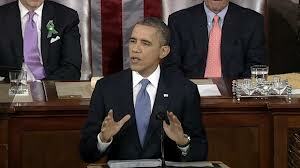 It is no secret that President Obama is a great speaker. He consistently delivers rhetorical brilliance in his eloquence before the American public and Tuesday night was no different. The President covered A LOT of ground in his address. He started by acknowledging the successful transition out of the Wars in Iraq and Afghanistan. He discussed the economic accomplishments we have had in increased domestic car production and sales and reduced oil prices. Citing these improvements in the American economy, he proclaimed that “the state of our Union is strong.” But, soon after touting these accomplishments, he started to list the tasks on his agenda for his second term. Admonishing his peers in Congress, he mentioned that Americans expect their representatives to put the “nation before party.” Garnering standing ovations on both sides of the aisle, President Obama urged his peers to keep the promises they have already made and make efforts to compromise where possible. With such a well planned speech deliberately written to evoke a sense of community and camaraderie, it was intriguing to see how the opposition would respond. President Obama pretty much took the Capitol to church and delivered a proverbial “sermon on the mount.” So, when Senator Marco Rubio (R-FL) showed up to give his two-cents he probably knew he’d come up after a pretty hard act to follow. Well, I am not sure if it was all the lights or the filler talk Rubio was rattling off but he got parched. He got so parched that he literally reached off camera, leaned over, grabbed the world’s littlest bottle of water, gulped it, and put it back. I am not kidding. See for yourself. Was it terrible? No. But it was definitely the gulp heard ’round the world. Senator Rubio has been doted upon by the Republicans in Congress for a few years now. His story (being the child of Cuban immigrants) has garnered him a great deal of acclaim. And, he is positioned to run for President in 2016. All that said, WTH? I mean, I have actually really enjoyed Rubio’s delivery up to this point. His speech at the RNC last year was just stellar. So, I say, let’s give the guy the benefit of the doubt. I get thirsty too. Regardless of Rubio’s lackluster performance, President Obama really showed his speaking chops. And, he will likely continue to do so for the next four years. What do you think? Did President Obama give the speech of his life? Was Marco Rubio’s “gulp” so bad? Is Attorney General Loretta Lynch the Real Answer to Chicago’s Police Problem?